I guess I will never be done with baking macarons. 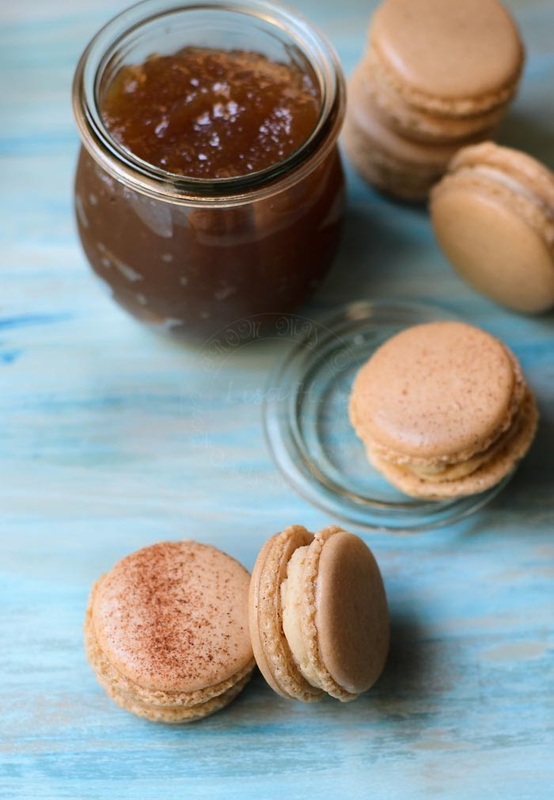 Its Apple Pie Macarons with Apple butter that I made in my previous post. This is my 7th type of macarons, in my macaron baking 'repertoire; :D.
My first ever macaron was Chocolate Macarons (an obvious choice :P ~ a failed bake). Hence I did not blog about it, just a quick note and photo. Moving on the 3rd, Lavender Macarons, inspired by spring in Perth and the heavenly lavenders scents wafting in the air, growing happily in my garden (the old abode). My 4th was the quirky taste macarons as my daughter put it. It was December, what else would inspire one to bake such a quirky taste macarons! After that quirky 4th flavoured macarons, I took leave from baking anymore macarons. After 3 years (more or less), I became curious of how the 'Real' macarons would taste like. Perth is considered 'small' city, we do not have Laduree or big guns selling macarons. Perhaps one or two odd coffee shops that sells some, but then again, what's real and what's not! I decided to learn from one of the best in Perth, an executive pastry chef. He is phenomenal. It was from the class that I learned how to bake 'THE real deal' macarons. My 5th macaron baking is my best macaron by far. 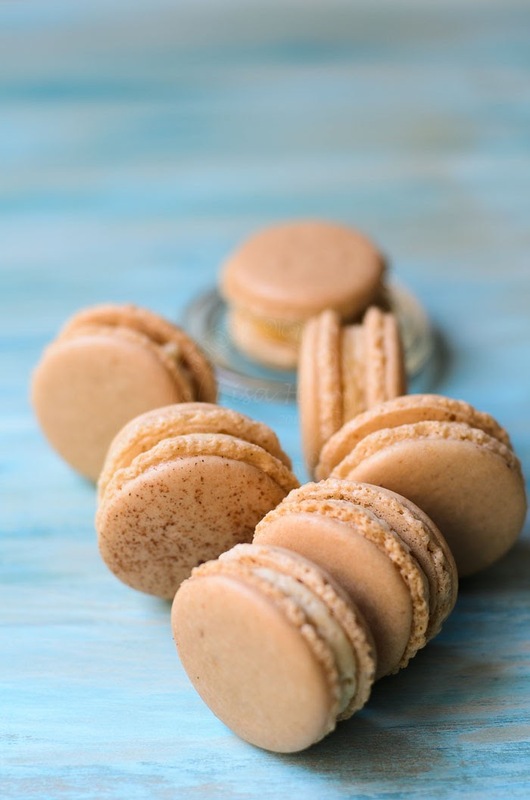 Its the salted caramel macarons. 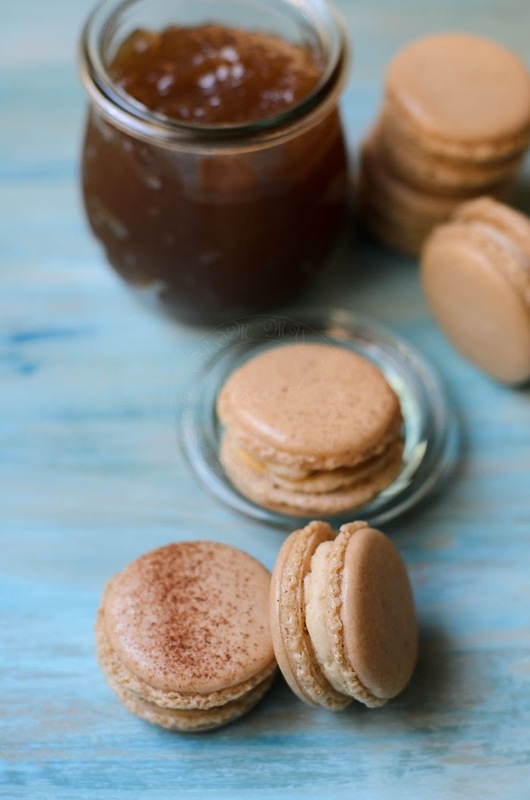 The salted caramel macarons, which I baked has a slightly different taste to José Maréchal version of Salted Caramel Macarons. 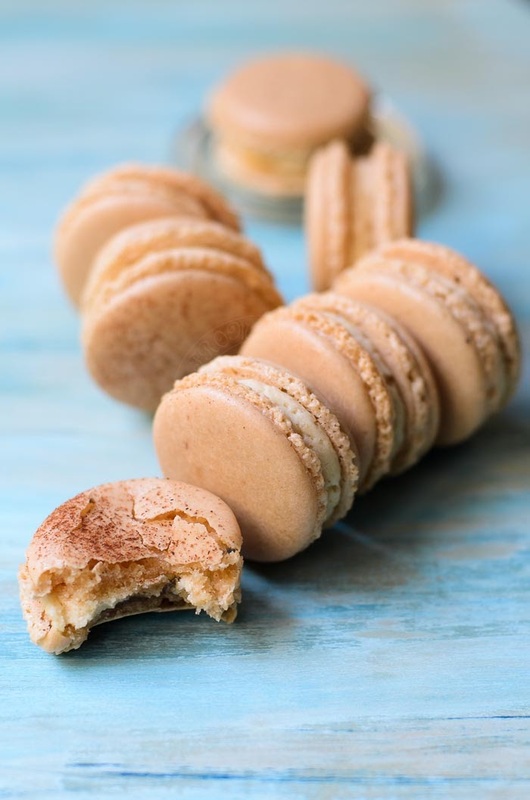 I had very positive feedback on my Salted Caramel macarons, all the time, every time:). I learned to use egg white powder! My 7th macaron baking were these gorgeous sweet bites. These Apple Pie macarons was inspired by the Apple tea, I received as a gift from Japan. The macaron shell was infused with Apple tea. It has a very subtle flavour, not too strong taste of tea. 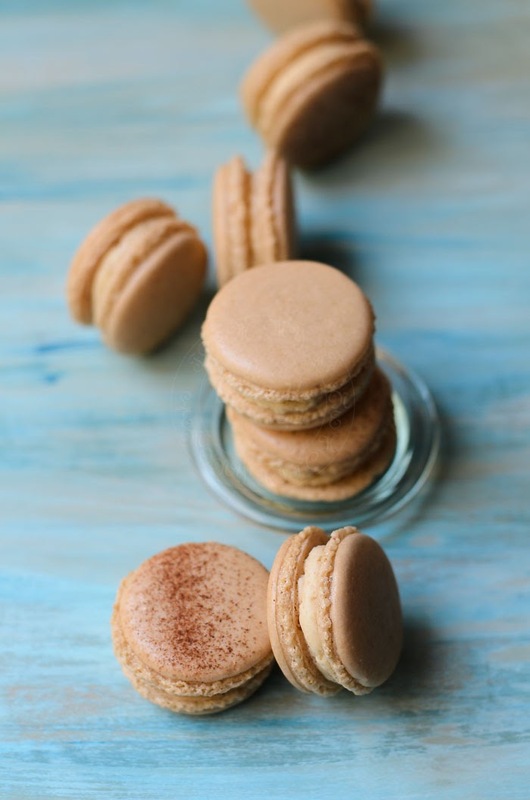 The baked caramel colours of the Apple pie macaron shells depicts the Apple pie as well as good to hide any oven 'hot spot' marking. 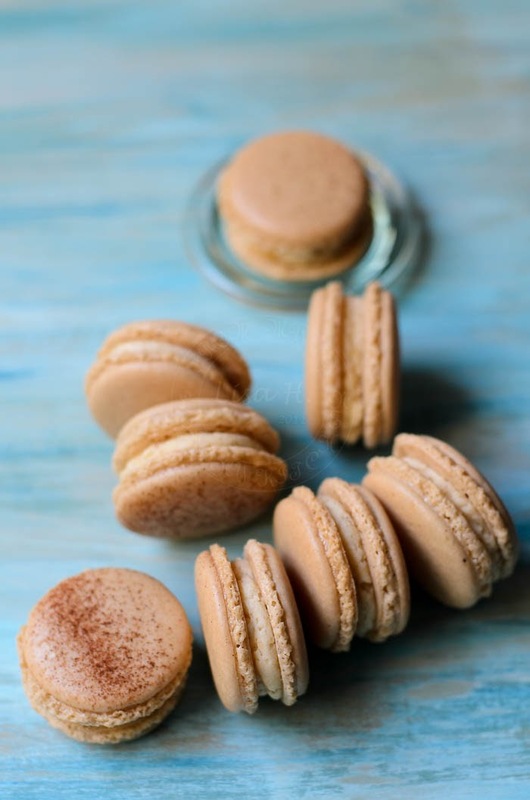 I have gathered enough courage and happy to announce that I am taking orders for Salted Caramel macarons. In a food processor, process almond meal with icing sugar. Sieve and set aside. Using kitchen mixer, whisk until soft peak. Add caster sugar all at once and whisk on medium speed for 8 minutes or until sugar dissolves. Incorporate half almond meal mixture into meringue. Gently mix and add the other half almond mixture. Place the 'dry to touch' macarons shells into oven. Reduce temperature to 140C and bake for 12-14 minutes. Transfer macarons to kitchen bench top and leave to cool before removing macaron shells from paper. Whisk all ingredients till creamy and consistent. Pipe the apple buttercream onto one macaron shell. Note : I used 3 bags of apple tea steeped in half a mug of hot boiling water for at least 10 minutes.